Sister Alphonse was very pretty. I can tell you that, although I never saw her hair. I knew her in Bellary during the years 1970 and 1971, a time when a woman wasn’t much thereabouts if her tresses didn’t knock about her knees. “This book is rubbish,” Sister Alphonse said and collected from the class the government-prescribed history textbook we had bought, and for a little extra, she placed an order for a replacement on our behalf. “Here’s a proper account of Lord Bentinck,” she said. “He abolished sati.” She spent a whole class describing the Black Hole of Calcutta, and the Muslim King Sirajuddaula, and seared a deep dark idea of the man into my twelve-year-old brain. She soaked the burning shame I felt in the balmy story of brave Robert Clive. I went to Calcutta the first time December last. I spent a few minutes before the obelisk that is the British-built monument to preserve the memory of the British dead in the Black Hole of Calcutta. The men had been crammed into an enclosure the night after Sirajuddaula ordered eviction of the British from their fort in Calcutta. A good number of the imprisoned died by morning; estimates vary from 43 to a peak claim of 123. Whatever the number, the redcoats managed to whip up support in Britain for military operations on land that they’d come to do trade in. Sister Alphonse was Scottish. Bellary used to have a British military cantonment, so it followed that the town had sprawling Christian schools. I went first to St. Philomena’s, where Sister Alphonse taught history, and some art and craft. Then I went to St. John’s. The Black Hole monument is no more upon the Black Hole, which hole was a mere guardroom that the British razed along with the fort it was in. They built an elaborate new defence and called it Fort William, and moved the monument around even in their time. It rests now in the quiet compound of St. John’s Church, the construction of which church began in 1784 under Governor-General Hastings. It was opened for Service in 1787 by Lord Cornwallis, the general who had earlier surrendered to George Washington in America. 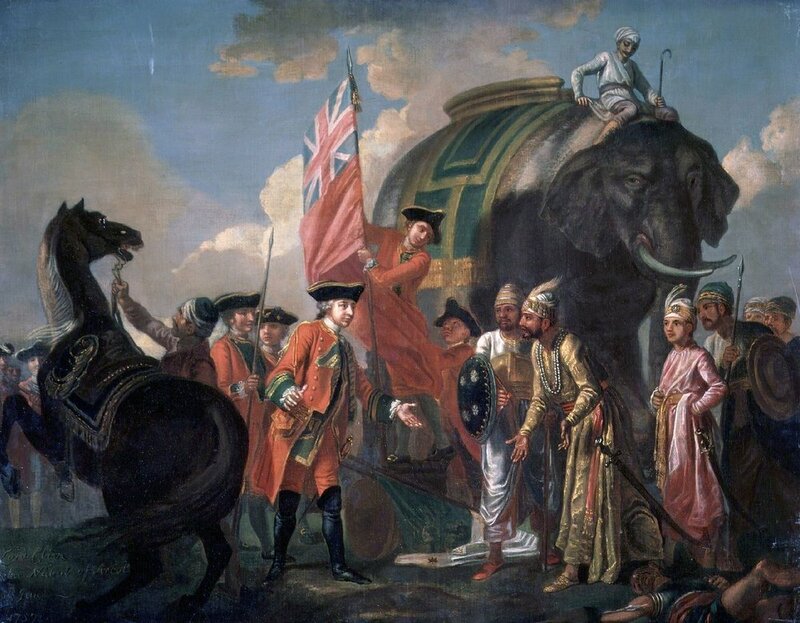 In India, Cornwallis would vanquish “tiger” Tipu Sultan and nearly complete the colonisation of the subcontinent. After they killed Tipu they installed a boy king in his place, and gave him Education and Culture and Revenue Collection for responsibility. They allowed him a harem. Sirajuddaula was a hot-headed 22 at the time of the Black Hole. He’d been incensed at the fortifications the British had been raising in his realm, in which his forebears had allowed them mere warehousing, with requisite guard. He ordered them to stop but they kept up the works and Sirajuddaula attacked. This was in 1756, and the British launched a reprisal in 1757. It didn’t matter that they’d commandeered only a 3000-man force against Sirajuddaula’s 50,000. The Indian generals were easily purchased and the king humiliated in an eleven-hour encounter in the Battle of Plassey. Later, Sirajuddaula was executed. Assassinated, it is also argued. “India was colonised not by Britain,” William Dalrymple has begun to insist with increasing intensity. His book that argues the case will be out this year, but excerpts from it have been circulating in print media: India was colonised by a corporation, The East India Company. And, along with British businessmen and aristocrats, Indian Marwaris were eager shareholders in the company. Dalrymple is a Scot. Beneath a picture shot by him and posted on Instagram, of a place in Bengal, he says female Hindu blood has entered his bloodline at a point. Dalrymple is big, robust. Hair that’s thinned on top is rich on cheek and chin and the colour of wisdom has erupted in thick lines along its length. He has the accent, and the scholarship, and, man, how he lets loose his grin! How he looks like Sean Connery! My father was nineteen when India became free. In Kollegal where he was raised, a forest town in thick jungle country, there used to be stationed a lone white man, a Forest Officer. “That man saw an ox once,” my father told me several times. “He asked for its tongue. They killed the whole handsome ox for it.” It’s only so much that my father experienced the English, and only in the ears. An aloof guy, he didn’t belong with the nationalists; and he was never neither with those arguing that British times were the best times. The government department he worked in retains the name given it in colonial times: The Department of Public Instruction. He retired as its top man. I was born in Mysore, not far from where “tiger” Tipu died. In 1999, some folks tried to organise the two-hundredth-year commemoration of Tipu’s fall. It didn’t happen. Tipu was Muslim. Also, there was an attempt a year before to mark the five-hundred-year-old landing of Vasco da Gama in Calicut in South India. That event didn’t materialize either. It was the Portuguese explorer’s discovery of the sea route that commenced colonisation in these parts. Not many feel grateful for that, history and heritage be damned. Every astrologer who has seen my horoscope has cautioned me to steer clear of water. No journeys by boat, but it’s okay to fly over the ocean. The admiral who took Robert Clive from Chennai to Calcutta to mount a reprisal against Sirajuddaula died four months after the mission was accomplished. Clive lived to loot rich Bengal which in those days fed the depleting treasury of the Mughal empire. Oudh fell next, and afterward the Mughal himself. Clive got very rich, but he killed himself in the end. He never got to be glamorous among his folks back home, though later they installed mighty statues of him. I have felt very small the times I’ve looked high at the one that looks to St. James Park. Sister Alphonse came from a well-off family, I think. I bumped into her once at the district maidan, where she was roaming with a compact video camera, the olden type that recorded on a reel of film. She was a radiant presence in the haze, crisp and fresh, in her ever-spotless ever-creaseless habit. “Step back, Shashi. Step back. Now walk toward me,” she kept saying, until she had me walking as she wanted. Then she filmed me. My mother was ever unhappy because she could never afford a drawing room like in the Woman & Home magazine that came from England, which she borrowed every month from a lending library. The other day, I attended “Dinner with Dalrymple” in Bangalore. “And for whom must I sign this?” Dalrymple asked me when I took a copy of his Kohinoor up to him. I’d been seventh in line. He wrote my name in a flourish on top of the page, and signed himself across the diagonal of it. The lines are blue and thick, rather like brush strokes. It is said of Clive, that when he marched, he used to have only a small contingent with him. Bystanders en route would outnumber his force in multiples, and they could’ve done in the firangi army on any of those occasions. But then, imagine on those plains a white man wearing red colours with gold trims on a great horse. There’s a question that never came up in class, nor does the question appear in any Dalrymple I’ve read. Or in the other books. At what point in history did we get so filthy? How came we to surround ourselves with this omnipresent squalor, and stink? “Why, Shashi has done something nice for a change!” Sister Alphonse exclaimed one morning in class. I’d drawn a pattern with felt pens, in red and blue. It must’ve looked good from her distance on stage, but the given task was to work with brushes. I don’t remember the punishment, but she got really cross with me that day. Calcutta was built in the fashion of London. It was the city of palaces, rich in architecture, rich in culture Indian and European. I walked round Dalhousie Square, taking in the enormous decayed cable-ridden Victorian, Edwardian buildings from which India was ruled. Afternoon, I walked to Park Street, went down it to the landmark Flurys, for tea and toilet. The toilet stank. Flurys was established in 1927. For twenty years of its lifetime it has seen English rule and highbrow English custom. Did the toilet stink so back then? Was the tearoom as pink then as now? If only there were jobs in Calcutta the educated Calcuttan would never leave the city. That is the claim, and it is untested for a long time because Calcutta has had no jobs on offer for decades now and her children are flourishing in other places. But I, I want no more a job, and I have decided to spend a few days every month for a year or two in Calcutta. I want to feel English rule from out there. I wish to add a few more words to the rich fact and the fiction that already exist. I wonder what Sister Alphonse might say to that.